For a spectrum image (SI) acquisition it is necessary to allocate a region on the survey image to be used for acquisition. These regions are marked by ROI markers in green. The type of the SI markers depend on the SI mode and can be either point, line or rectangle ROIs. You can position, resize and remove the survey ROI like any other ROI marker. Add a survey ROI by selecting a SI mode. If the STEM-SI palette is in mode selection state, selecting any mode will automatically add the appropriate survey ROI to the survey image which is also automatically assigned by this action. The position and size will be the same as the one used for the last SI acquisition of that type. Add a survey ROI by using the floating menu. When you right click a recent image on the View workspace, the SI ROI tool in the floating menu will appear. This dropdown menu allows you to select the SI type. With this tool, you can create the survey ROI directly on the image. Then, the image is automatically assigned as survey image while the spectrum imaging mode is adjusted. Other, now obsolete survey ROIs are automatically removed. Note: For Multi-Point, keep the Shift key pressed while adding a point to keep the tool active and allow multiple points to be added in a series of clicks. Use the mouse to click the ROI marker while you press the Delete key on the keyboard. If all survey ROIs of the current SI mode are removed, the STEM-SI palette automatically reverts to mode selection state. A regular 2D SI consists of an array of equally spaced points in X and Y. It is represented as a single, rectangle ROI in the survey image. Resizing the survey ROI will keep the total number of pixels and hence total acquisition time approximately constant. The SI size in pixels as well as the sampling resolution will change automatically when the ROI is resized. The survey ROI will snap to positions of appropriate size and aspect ratio. The smaller the total number of pixels in the SI, the rougher those snaps may appear. A 1D SI consisting of an array of equally spaced points along a line. It is represented as a single, line ROI in the survey image. A yellow cross indicates the start position of the scan. If the averaging option is enabled, the cross is replaced by a yellow line that indicates the averaging direction and width. Resizing the green survey ROI will adjust the sampling resolution, but keep the number of sampled points constant. Changing the dimensions of the yellow survey ROI will adjust the averaging width, but keep the number of sampling points along that direction constant. You can adjust the averaging direction angle by pressing the Ctrl key down while you drag the green handle of the yellow survey ROI. Deleting the yellow survey ROI will switch the averaging option off. A set of point spectra acquired with identical parameters from individual spatial positions collected in a 1D SI data container. Each point is represented by a single, numbered point ROI in the survey image. This number specifies the spectrum position within the SI data container. Points are most conveniently added using the SI ROI tool from the floating menu. Keeping the Shift key pressed allows multiple points to be added in a series of mouse clicks. You can remove individual points by selecting them and pressing the Delete key. The remaining points are automatically renumbered. Click the Arrange points buttons to arrange the selected set of points or, if none are selected, all points. If a rectangular ROI is selected, points are arranged within this area, otherwise they are arrange over the entire survey image. Selection of 9 points and destination area (left). Randomize positions in the area where each point is given an arbitrary position within the area (right). Arranged points along a regular grid (left). Arrange point along a regular grid, but randomize around this position (right). A set of spectra sequentially acquired with identical parameters from the identical sample area collected in a 1D SI data container. The sample position is either represented by a point ROI for stationary acquisition or by a rectangular ROI if the 2D Scan option is enabled. Resizing the 2D Scan area is restricted by the number of sampling points of the scan, which in turn is limited by the SI Pixel Time. Slower scans allow higher sampling. 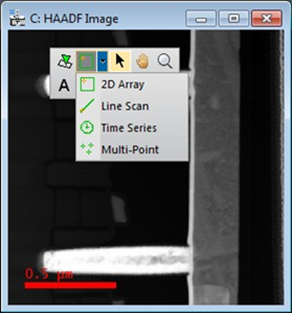 To access larger scan areas, it can therefore be necessary to either reduce sampling with the spin controls for the 2D Scan fields and/or to increase the Pixel Time.